Ecological Psychology and Social Psychology: It is Holt, or Nothing! What is the greatest contribution that ecological psychologists can offer social psychology? 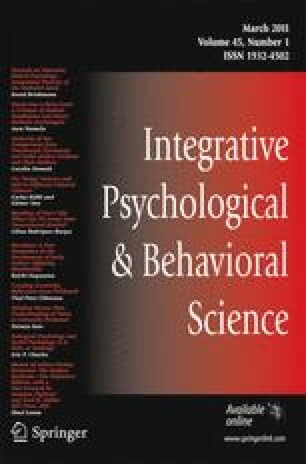 Ideally, ecological psychologists could explain how people directly perceive the unique properties of their social partners. But social partners are distinguished from mundane objects because they possess mental traits, and tradition tells us that minds cannot be seen. When considering the ideal possibility, we reject that doctrine and posit minds as perceivable. For ecological psychology, this entails asserting that minds are the types of things able to structure ambient energy. Contemporary research and theory suggests distinctly ecological ways of attacking this problem, but the problem is not new. Almost 100 years ago, Holt argued for the visibility of minds. Thus when considering these ideas, ecological psychologists face a choice that is at once about their future and their past. Extending ecological psychology’s first principles into the social realm, we come to the point where we must either accept or reject Holt’s arguments, and the wider context they bring. In doing so, we accept or reject our ability to study the uniquely social. Alas, all of my thanks must go out amorphously, rather than specifically: The authors who are contributing to my edited volume on Holt (coming out this Fall) have made me evermore firm in my convictions that much good would come of resurrecting this almost-forgotten man, who was once a giant. This article was spurred directly as a result of wonderful personal conversations at meetings of the International Society of Ecological Psychology, and by the published commentaries on my previous work. Regarding the latter, I must thank Jaan Valsinar and his editorial staff for creating a venue in which discussions of this type can take place. IPBS has a long history, but the diversity of ideas it has been home to, following the recent changes in leadership and format, are admirable. One can be braver when saying daring things, if he knows others will have the chance to respond.